When you’re planning a trip away skiing, the last thing you want to think about is the stress of getting there. Instead of dreaming of epic powder runs and long lunches in the sun, many find themselves worrying about the logistics of travelling to their snowy destination; How long will it take? How do I get all my gear there? How much will it cost? So, to put your mind at ease, we’ve written our top tips for getting out the mountains as easily and stress-free as possible so that you can concentrate on enjoying your time away! For Morzine, flying is the obvious choice for most travelling out to resort, with Geneva airport is a mere 1.5 hour transfer away. If you’ve got easy access to an airport at home, this will most likely be the quickest route making it ideal for short breaks and for those who hate long journeys! Other nearby airports include Chambery, Lyon, Grenoble and Italian Turin; all within 150 miles of Morzine. Currently, there is a huge selection of airlines flying into these airports from the UK and there are plenty of cheap steals to be had! So make use of websites like skyscanner.com to easily compare dates and prices. 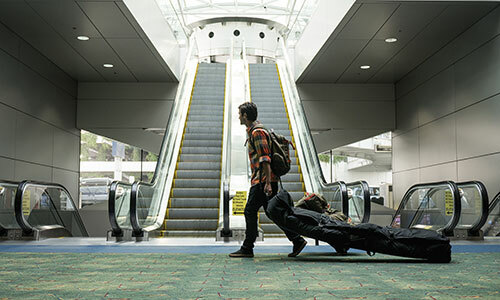 One thing to consider when flying is bringing excess luggage such as skis and snowboards, as these can be a pain to transport and end up cost more than expecting. For the budget airlines, expect to pay up to £40 for sports equipment of 20kg (Ryanair, 2017). In comparison, driving from the UK can be much more convenient and save you some serious cash over the holiday periods. If you’re travelling in a group or as a family, it will often be cheaper in fuel than flights, not to mention saving money on extra luggage fees and having the freedom to bring as much as you like. However, don’t forget to keep in mind the cost of motorway tolls coming through France as these can soon add up. Check your satnav or google maps for alternative routes if you want to avoid these. Pack smart. It sounds simple, but how many of us head away on holiday with a whole wardrobe worth of clothes and wear less than half? On a ski holiday, you end up spending the majority of your time up the mountain in your ski gear and boots, so don’t worry too much about bringing those 5 pairs of shoes, instead make sure you have a couple of changes of thermals and some spare socks for the hill. Mountain towns like Morzine are known for being casual and get pretty cold at night! So you might want to leave your dress and heels at home, even if you want something a little smarter for dinner. Save on packing and bring comfortable, practical clothes that will keep you warm around town and you can recycle throughout your trip. We recommend bringing a couple of pairs of jeans that you can happily wear every evening to keep your packing down. If you’ve paid for a ski or snowboard bag on a flight, make use of it! Buy a bag that has room for extras and pack as much as possible to avoid having to pay for other checked baggage. Snow gear is very light and mouldable even though it appears bulky, so compress it until all of the air is out, and roll your pants/fold your jacket as small as possible. Doing this a few days before and weighing them down with something will help get all of the air out and make them easier to pack! If you need to save on weight, use your boot bag as your carry-on luggage. Pack using a clever a bit of tetris and you’ll fit much more into small bags; stuff your socks, gloves and hats in your boots, and if you’ve got a snowboard bag put your goggles inside your bindings to protect them and save space. If you’ve got a helmet and you’re carrying a backpack on the flight, strap it to your back to save space in your checked baggage. Previous: Are You A Last Minute Maverick?